Shoppers are getting used to those 75 percent off sale signs, and that's bad news for merchants who worry they will also have to quickly slash prices on spring goods to attract customers. Anxieties about how rampant discounts have affected shoppers' psyches and stores' profits are running high ahead of expected dismal December sales figures on Thursday. The holiday season is anticipated to be the worst in decades. Already, retailers including Bebe Stores Inc. and J.Crew Group Inc. are cutting prices on selected spring styles to lure sale-savvy shoppers. "It is a vicious cycle that no one wants to continue," said Gilbert Harrison, chairman of Financo Inc., an investment banking firm specializing in retailing. The discounts will be a key topic at Financo's annual dinner on Monday for retail chief executives. In addition, retailers expect competition from a rise in liquidation sales — the fallout from the horrible holiday period. Merchants struggling to clear out mounds of deeply discounted coats and sweaters are wondering how they are going to get nervous shoppers to splurge on new spring products. The deep price cuts are making shoppers question the true value of items. If they can get $200 jeans at 60 percent off, will they be willing to pay the original price next fall? "Our sense of what is fair and what is a good deal has changed," said Michal Ann Strahilevitz, professor of marketing at the Golden Gate University's Ageno School of Business. She said that a sale has to be at least 70 percent off to be considered a bargain now. Marcia Layton Turner, a mother of two from Rochester, N.Y., recently walked away from an outfit that she spotted at a local Kohl's store that was 50 percent off. "Forty to 50 percent used to excite me," the 43-year-old writer said. "Now, I want at least 70 percent." Turner says she has taken advantage of 75 percent discounts on children's clothes in recent weeks and is willing to wait to get the same type of deals in the coming months. Consumers across the spectrum have been holding back. Overall sales of apparel fell 17.3 percent from Nov. 30 through Jan. 3, while footwear sales dropped 12 percent compared to the same period a year ago, according to figures released Wednesday by SpendingPulse, a data service provided by MasterCard Advisors that estimates U.S. retail sales across all payment forms including cash and checks. Sales of electronics and appliances dropped 21.4 percent, while luxury goods suffered a 27.6 percent drop. Online sales rose 4.6 percent. Fourth-quarter profits are likely to decline more than 19 percent, said Ken Perkins, president of research company RetailMetrics LLC. Excluding Wal-Mart Stores Inc., one of the few bright spots, he said the drop is expected to reach almost 28 percent. Perkins predicts that profits will keep falling into the first quarter, projecting an 11 percent drop; excluding Wal-Mart, that figure is likely to fall more than 17 percent. The financial meltdown in September that led to an abrupt halt in spending came too late for merchants to dramatically adjust spring inventories. Many stores order goods four to seven months in advance. And while spring inventories are estimated to be down as much as 30 percent from year-ago levels, many analysts say that inventories should be down even more. Barclays Capital analyst Jeff Black believes it will take at least until the back-to-school season to get inventories in line with consumer demand, and even then stores will still face the challenge of weaning shoppers away from deals. For those shoppers who could still load up on deeply discounted merchandise, the last few weeks have been paradise. Even before the Thanksgiving weekend, the traditional start of the holiday shopping season, Saks Fifth Avenue marked down shoes by 70 percent. But earlier deals look measly compared with some current offers as merchants try to get rid of their holiday products by the end of the month. The upscale DKNY store on New York's Madison Avenue is plastered with a sign proclaiming "Up to 90 percent off." 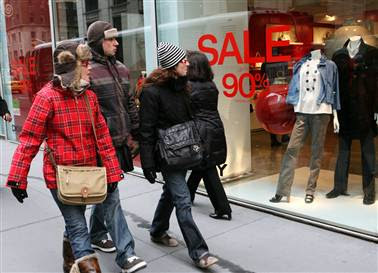 As retailers work to clear out old merchandise, analysts say many are trying to hold back on discounting new winter and spring items. Dan de Grandpre, editor-in-chief of dealnews.com, said he is seeing more bundling deals — a flat-panel TV that comes with a free Blu-ray system, for example. But many doubt that such strategies will work and predict early discounts on spring goods. The signs are already there. Bebe has cut certain spring sweaters by 25 percent, while J.Crew has marked some spring items anywhere from 25 to 40 percent off, according to Amy Wilcox Noblin, an analyst at PaliCapital Inc. It will be years before shoppers are going to be enticed by discounts of less than 50 percent, said C. Britt Beemer, chairman of America's Research Group. Traditional stores have also had to dump more excess goods at off-price retailers like TJ Maxx, which reduce prices more, said Marshal Cohen, chief industry analyst at market research firm NPD Group Inc. But a bigger problem is liquidation sales at stores that are either closing specific locations or shutting down the entire business. Going-out-of-business sales at KB Toys and Linens 'N Things put pressure on other retailers even before Christmas, and analysts expect competition to get fiercer amid a likely spike in bankruptcy filings. James Schaye, president and CEO of Hudson Capital Partners LLC., which has overseen liquidations of Mervyns LLC, Tweeter Home Entertainment Group Inc. and Steve & Barry's, estimated that his company liquidated about $3 billion in merchandise in the October through December period, compared with about $400 million a year ago.